US President Donald Trump has thanked Rex Tillerson for his service and confirmed that CIA Director Mike Pompeo will become the new secretary of state. President Trump tweeted that he was confident that Pompeo would do a "fantastic job" in his new post. Trump nominated intelligence officer Gina Haspel to replace Pompeo at the CIA. Trump appointed Haspel, a counterterrorism specialist, as the CIA's deputy director in February 2017. She will be the first female director in the agency's history. Speaking to reporters outside the White House on Tuesday, the president emphasized that he had made the decision to sack Tillerson himself, adding that he felt "Mr. Tillerson will be much happier now." A White House official has indicated that the cabinet shuffle was connected to Trump's desire to shake up his team ahead of upcoming talks with North Korea. Earlier this year, Pompeo warned that Pyongyang was just months away from having the capability of launching a missile at targets anywhere in the US. Last year, the CIA director hinted that he favored regime change in the country. Trump also confirmed Tuesday that while he and Secretary Tillerson "got along…quite well," they disagreed on a number of issues, including the Iran nuclear deal. 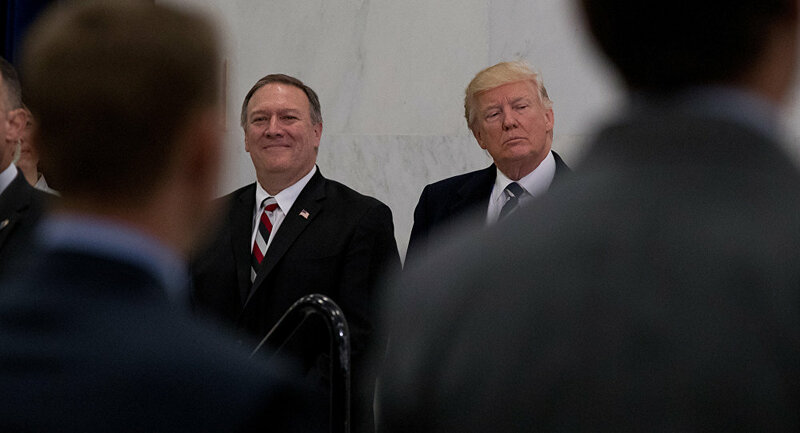 Trump chose Pompeo as his CIA director in January 2017. Prior to that, the official served as a lawmaker in the House of Representatives' select committee on intelligence, and the subcommittee on the CIA. Pompeo's other duties in Congress had mostly been limited to domestic affairs, including energy and the subcommittee on digital commerce and consumer protection. Before Tuesday's announcement, rumors circulated for several months that Secretary Tillerson was considering resigning from the post. Pompeo told Fox News Sunday that Washington was keeping a close eye on Russia's state-of-the-art weapons programs, and said that whether it was Russian weapons or Chinese weapons, "America is required to make sure that we have defenses that respond to them." Earlier, he said he had "every expectation" that Russia would try to meddle in the US midterm elections this fall. Regarded as a hawk on Iran, Pompeo has called on the US to withdraw from the 2015 nuclear deal, and has repeatedly warned of Tehran's growing influence in Iraq and throughout the Middle East. Pompeo has also condemned the activities of whistleblowing group WikiLeaks, and characterized the organization as a threat to US national security. Asked to comment on Pompeo's appointment, Yevgeny Serebrennikov, first deputy chairman of the Russian Senate's committee on defense and security, said that Moscow was ready to cooperate with the new secretary of state, but has no illusions about the prospects of improving Moscow-Washington ties. "Russia will cooperate with all those appointed to this or that post in the Trump administration. We are pursuing a course of reducing tensions in relations between our countries, but our partners apparently do not share this aspiration," Serebrennikov said. Public reaction to Tillerson's ouster and Pompeo's appointment has been largely polarized between Trump supporters and opponents, with some people considering the broader implications for the Trump administration. — Gaye Gallops ♦️ (@gaye_gallops) 13 марта 2018 г. — RP4America1st (@rp4freedom1st) 13 марта 2018 г. — Keith Boykin (@keithboykin) 13 марта 2018 г. — Clint Watts (@selectedwisdom) 13 марта 2018 г. Departure of Tillerson is not good news for Mattis. They had a good rapport and alliance and periodically allied to counterbalance Trump. Pompeo was not part of that. He is an enabler to Trump--not a counterbalance. — David Rothkopf (@djrothkopf) 13 марта 2018 г.